If this were true when writer Jerome K Jerome published ‘Three Men in a Boat (To Say Nothing of the Dog)‘ back in 1889, how much more so does it strike a chord now, in the craziness of the 21st century? There’s something magical about that feeling of stepping back in time when you stroll through an ancient place, and imagine it as it was a hundred, two hundred, even a thousand years ago. The beautiful hilltop village of Monsarez in Portugal’s Alentejo is just such a place; there is evidence the hilltop has been settled since prehistoric times. In the last two millennia, many different powers have occupied it, each leaving their mark. Today, the castle and village are both well-preserved and a popular tourist attraction, not least for the stunning views out over the landscape in all directions. 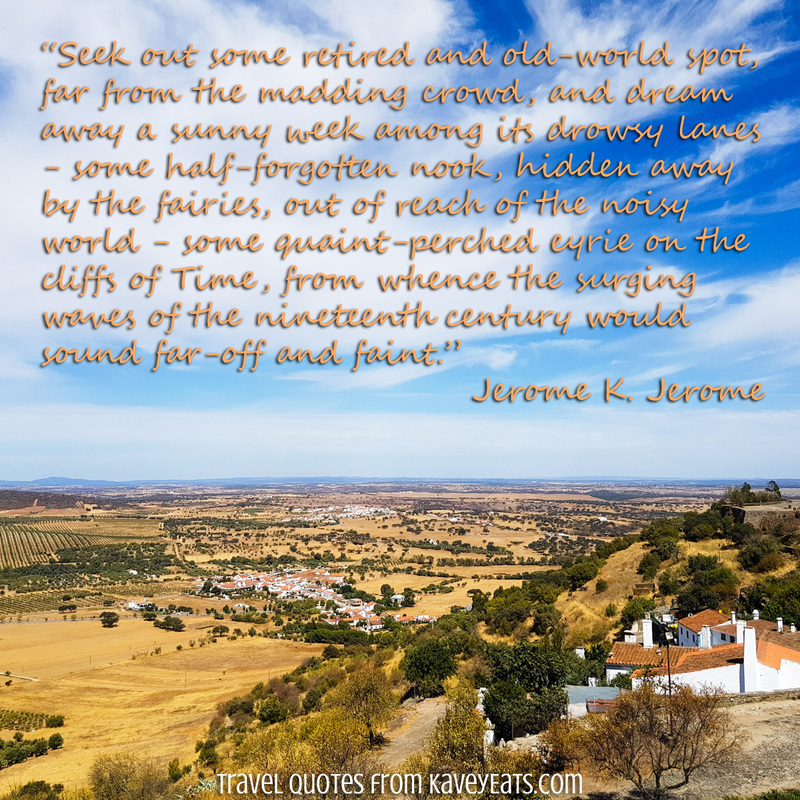 8 Comments to "Travel Quote Tuesday | Far From The Madding Crowd"
I have to learn to travel that way sometimes. It sounds amazing on paper, but in my head I get so restless and I want to see things and do things. But there is definitely something to be said for kicking back with a good book and relaxing in a place where no one can get to you. This quote makes me think of Ireland. There were so many quaint places to hide away. Sometimes in the business of discovering a new place I forget to stop and breathe. Gorgeous quote! It reminds me of so many travels back when I had time to backpack long term. With mostly weekend getaways these days, it’s hard to find that same sense of timelessness. The quote definitely strikes a chord. I love exploring the less explored and less crowded places. It fascinates me to be lost in a place that has seen various chapters of history and survived the odds of time. Such places have a unique beauty and curious vibes. I agree, I also like to explore the less crowded places and the ones that are forgotten. Such places have a unique beauty and curious vibes. It’s always tempting to check out those famous touristy spots everytime I’m in a new place, but there’s always something wonderfully beautiful and peaceful about stepping in some of the hidden gems that not a lot of people visit.